Trading standards officers investigating bogus charity collectors in Cardiff have arrested a man after calls from the public. 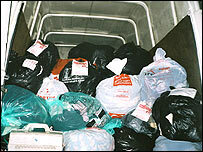 Complaints had been made about leaflets advertising a clothes collection scheme, claiming to be on behalf of charities. But in fact the clothes were being sold for profit. A man has been questioned and released on police bail after investigators found 77 bags of clothes at an address. A spokesman for Cardiff Council said that following appeals for reports of bogus collections, it had received "a significant number of calls about collections that were due to take place this week." The spokesman added: "Trading standards and police officers have reacted to the public intelligence gathered from the campaign and have now made an arrest in connection with a collection which was taking place in a suburb of Cardiff." He said that 77 bags of clothing were found with various company names including some that had been labelled for genuine charities like Noah's Ark, Royal Heart Foundation, Salvation Army, Great Ormond Street and others. All the clothing that was seized by trading standards will now be donated to genuine charities across the city. One man was arrested during the raid but has since been released on police bail pending further inquiries. Deputy council leader Judith Woodman said: "I'm pleased to see that the recent trading standards campaign has led to this arrest. "Bogus charity collections are on the increase across Wales and members of the public should be on their guard against these scams which is an abuse of their generosity and highly detrimental to genuine charities." There are thought to be a number of charity collection scams operating in the city using various names and guises with the most common method involving the distribution of leaflets asking for bags of clothes to be left outside properties on certain days. The council has sent out leaflets to households across Cardiff urging them to be vigilant. In 2004 the UK trading watchdog issued a warning about bogus charity collectors saying genuine charities were losing £1m a year because people mistakenly give unwanted belongings to fraudsters. The Office of Fair Trading said households were tempted with flyers promising to distribute unwanted belongings to poor countries.